A few days ago, James Hamilton had a blog post on the global oil market. He puzzles over this set of facts: From 2005 to 2007, Chinese crude oil consumption went up by 860,000 barrels/day, while global output dropped by 30,000 barrels/day. How could this have happened? One element of an explanation could be like this. We know that China produces a lot of widgets. Chinese market share in world production of widgets has been growing fast (e.g. see this graph with growth of Chinese exports to the US). The production of widgets requires energy. Chinese `market share' in energy consumption should rise with the gains in Chinese `market share' in manufacturing production. As manufacturing work shifts to China, it would look like Chinese GDP is incredibly energy-intensive, while other locations would seem less energy intensive. By the above calculations, China's consumption went up from 8% of world crude oil output to 9% from 2005 to 2007. That's roughly consistent with Chinese share in world merchandise exports. In March 2009, Dincer and Eichengreen wrote an NBER working paper where they found that RBI was one of the least transparent central banks in the world. Today, on voxEU, there is an article describing a new paper on the subject: Central bank independence and transparency: Evolution and effectiveness by C.Crowe and E. E. Meade, European Journal of Political Economy which has a fresh attack on the problem of measurement of central bank transparency. They find that RBI transparency worsened between 1998 and 2006, and that the 2006 level was amongst the worst in the world. The first task for the new RBI governor is to implement the article by Helene K. Poirson which explains nuts and bolts about what is wrong with RBI communication, and how this can be addressed. I think that a critical element of that is better data disclosure: RBI needs to start releasing currency trading data on a daily basis. Ahead of the quarterly review of monetary policy on 29 July, the Reserve Bank of India (RBI) auctioned Rs6,000 crore worth 10-year bonds on Thursday at a cut-off yield of 9.0785%. Following this, the benchmark 10-year bond yield, which was trading at 9.01% until late Thursday afternoon, rose to 9.09%. While it is not exactly an indication of market expectations from the monetary policy to be unveiled next week, bond dealers say they are trying to figure out the underlying meaning of two important moves of the central bank involving the auction. RBI was originally slated to auction a 14-19 year bond but, later pared the maturity to 10 years. It has also used the uniform pricing method to auction the bonds after a gap of two years. Normally, government bond auctions follow the practice of multiple pricing. This is also for the first time the buyers of government bonds, such as banks, insurance firms and primary dealers, had to make bids without being aware of the latest inflation figures. One can interpret the paring of maturity of the bond as a signal from the banking regulator on the interest rate outlook. The rates will go up and it does not want financial intermediaries to lock themselves in for longer period as they will have to take the hit and make good the depreciation in value of bonds, said a dealer who didnt want to be named. J. Moses Harding, head of the wholesale banking group at IndusInd Bank Ltd, also echoed the same view. Probably RBI is taking a view that interest rates are on the higher side, he said. So, why lock in for a longer period and pay more? Some other dealers say the central bank shifted to a 10-year bond for the auction because of the low demand for longer term papers. Insurance companies that generally buy longer term papers, dont have much surpluses to buy longer term bonds, said Harihar Krishnamurthy, head of treasury of Development Credit Bank Ltd. According to Joydeep Sen, vice-president, advisory desk of BNP Paribas, the auction of a 10-year paper instead of a longer term bond, is possibly to reduce the borrowing cost of the government as longer bonds command higher interest rates. Possibly the government is trying to fine-tune its borrowing cost and it also wants to issue more liquid papers to boost the sentiment, Sen said. Under uniform price method, all successful bidders receive the bonds at the cut-off prices irrespective of their biddings while in multiple price auctions, bidders receive bonds at their bidding prices as long as they are within the range of the cut-off price. According to bond dealers, the uniform pricing was adopted to shield investors from higher volatility. Probably RBI wanted a better pricing. Uniform pricing normally ends up at slightly more bullish than multiple pricing. You dont have the bidding risk or winners curse there, said A. Prasanna, vice-president, ICICI Securities Primary Dealership Ltd, a firm that buys and sells bonds. A winners curse happens when a bidder overpays to buy bonds in multiple auctions. In case the prices go down, the aggressive bidders lose the most. The government wants to raise Rs96,000 in bonds in the first half of the financial year. So far it has raised some Rs66,000 crore. A NewsWire18 story of 22 July quoted an unnamed finance ministry official as saying that the bidding was done on Thursday to beat release of inflation data. The market is full of questions and speculation. Why was the date of auction not changed though inflation data release changed? Why was a 10-year bond issued instead of a 14-19 year bond as originally slated? Why was uniform pricing introduced? Since RBI is both central banker and investment banker to the government, do these decisions of RBI reflect knowledge of the future course of monetary policy being utilised to lower the cost of financing for the government? You might be inclined to dismiss this newspaper article as reporting market gossip. But this kind of market gossip is a measure of the thinking of the market. When the market is faced with these kinds of uncertainty, it ultimately damages the interests of government as an issuer. A customer is willing to pay more for a bond (i.e. a lower interest rate) when he is confident about what is going on. When a customer is confused (through lack of transparency) or worried that he's being had (through conflicts of interest), bond prices will be lower (i.e. the cost of financing will be higher) so that the customer is given a discount in return for the greater risk that he is facing. This episode vividly illustrates the consequences of the mistakes in India's financial architecture. The investment banking function for the government should not be placed with the central bank. Markets must feel that the investment banker has not the slightest links to monetary policy. The investment banker must not have an inside track on knowing the future course of interest rates. When markets feel confident about this, when they know that the investment banker to the government is not playing games with them, markets will supply financing to the government at a lower cost. To use the architecture of the RBI Act of 1934 (conflict of interest between monetary policy and investment banking), and then suffer from higher cost of financing for government as a consequence. To use the architecture of the RBI Act of 1934 (conflict of interest between monetary policy and investment banking), but forcibly obtain low cost financing for government through financial repression -- i.e. forcing financial firms to buy government bonds. To separate out the investment banking function into an independent Debt Management Office (DMO), which has no links with the central bank. This will reassure markets that the moves of the DMO do not reflect game-playing by the DMO based on a knowledge of the future direction of interest rates. This has been recommended by several expert committees, including the Mistry committee. This is an example of what a proper institutional architecture is all about. In a mature market economy, the various functions of the State are placed in agencies without conflicts of interest. Each agency has a clear role and clear accountability, and operates with full transparency. In India, our landscape is filled with obsolete laws and obsolete architecture. Becoming a mature market economy is critically about making changes to the financial architecture. 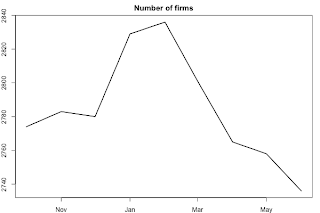 The CMIE Cospi index is a total returns index of all firms in India where trading took place on atleast 66% of the days in the last six months. This is a weak liquidity filter. 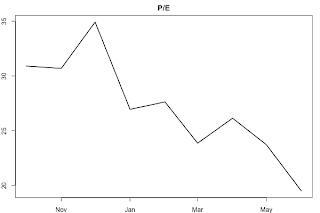 For all practical purposes, this is the Indian equity market. The Economic Times would scream in their headlines that over Rs.25 trillion of wealth has been destroyed. But even at Rs.45 trillion, the stock market remains the most important component of Indian finance. As I often like to say, Indian finance is a plane running on one engine: the equity market. 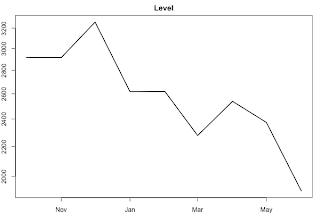 I'm impressed at the equanimity with which the Indian economy has digested this decline in stock prices. In the past, these kinds of large movements would have generated a lot more turmoil. On one hand, every time large price movements took place, there would be accusations of a scandal. It would be claimed that there is some fraudulent foundation of the change in prices. Or, there were fears of a payments crisis whenever prices moved. And, sadly, India had a long history of difficulties on the equity market, so some of these fears were justified. But with the equity market reforms from 1994 to 2001, these fears have largely subsided. Under socialism, prices did not change, so fluctuations of prices are often bewildering to people who spent their formative years under socialism. People who do not understand how financial markets work are prone to jump to the conclusion that these fluctuations are somehow wrong. On one hand, this leads to claims that the markets are a gambling den. I have met some senior economists in India, who had occupied prominent positions in government, who believe that all capital inflows into India are based on fads and whims, that there is no information processing or forecasting or economic logic underlying capital flows. This kind of ignorance leads to demands that the government should do something every time prices change. When prices go up, the government is pressured to try to bring down prices. When prices go down, the government is pressured to try to push prices up. In the socialist worldview, prices are fixed, so all price volatility is bad. 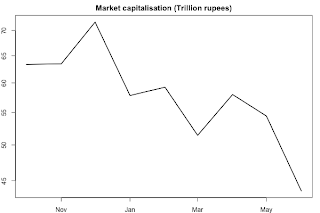 But we're getting better: The CMIE Cospi market capitalisation dropped by Rs.25 trillion and we're hearing none of this. As the years go by, people out there in the real world are grappling with India as a market economy, and particularly the younger generation is coming to terms with the idea that prices must change in response to news; that a market where prices do not change is actually rigged. So the good news is that we're growing up. When we attain this state of equanimity with fluctuations of the exchange rate, I will write a blog post saying that we have grown up. On the subject of finance as a shock absorber, see Finance and growth: When does credit really matter? by Fabrizio Coricelli which offers new arguments about the mechanisms through which financial sector development influences economic growth in developing countries. Two members of SEBI M. S. Sahoo, 14 July 2008; K. M. Abraham, 21 July 2008. In 2002, when the US Congress was debating whether to close the "Enron Loophole" that is, to require that over-the-counter energy markets be brought under the full oversight of the US futures regulator Republican Trent Lott rose to his feet in the Senate chamber. Brandishing a dictionary, the senator looked up a definition of "a derivative", a term referring to the complex futures contracts used in the energy markets to hedge the risks associated with holding physical supplies of commodities such as oil and natural gas. The dictionary told him that it was "the limit of the ratio of the change in a function to the corresponding change in its independent variable as the latter change approaches zero". Mr Lott turned to his colleagues with a warning: "We don't know what we are doing here. I have serious doubts how many senators really understand [this] and it sounds pretty complicated to me." I think recent events underline the importance of the appointments process. Faced with the complexity of the modern economy and particularly modern financial markets, you need people like Paulson, Bernanke in key positions of influence. The staffing challenge is particularly acute in emerging markets where we get a vicious cycle: financial markets are repressed, which impedes knowledge and experience about finance, which impedes human capital development, owing to which people more like Mr. Lott often endup running the show. Some New Perspectives on India's Approach to Capital Account Liberalisation by Eswar Prasad, for NCAER's India Policy Forum. Saubhik Chakrabarti says that the Left hadn't understood `coalition dharma', the essential ingredient that makes coalition government work in India. quantcast is an interesting new approach in Internet usage measurement. They have you put a fragment of HTML on the page that you want measured (just like sitemeter or sitecounter do). What's new is that they have instrumented a large number of households in the US. They know quite a bit about the households that have been instrumented. They watch for visits to your web page from these households and report summary statistics to you about this set. (It's a little more complicated than that. Even though they have ~ 1.5 million instrumented households, only a tiny number of these would show up at any blog e.g. this one. Sampling noise would then be unacceptable except for a small number of high traffic websites. They manage to track users across a large number of websites (e.g. this one), and have setup statistical models using which inferences are made. I thank Konrad Feldman of Quantcast for explaining these things to me). 68% are male (a bit more than the average on the net). It's a bit above average in the representation of high income groups. 37% have household income from $60k-$100k and 22% are above $100k. In terms of age, 44% are from age 35 to age 49, which is above average. There is of course almost nobody from age 3 to 17. In terms of ethnicity, it's 61% caucasian, 8% african american, 24% asian. 83% have no child in the household, which is a bit above the overall average. 34% of the households have a head of household who's been to grad school: this is 2.5x bigger than the overall average. After all, you do have to be a genius to read this blog. Watching feedburner, I know there are roughly 2000 subscribers to the feed. Using sitemeter data, there are roughly 16,000 visits a month. Quantcast says these visits come from roughly 7000 unique people who show up at the blog per month. Of these, 2000 are from the US. 52.65% are from India. This number (Indian share) has gradually risen over time: I suppose this reflects the growing usage of the Internet. You might like to see this piece that I wrote at the end of 2006, looking back at one year of blogging. Indian Express has an article by Neha Sinha on the relocation of tigers to Sariska and the problems of wildlife conservation in Sariska and Ranthambore. While reading this, I wondered: Sariska has an area of 866 sq.km. - is that enough to hold a Minimum Viable Population (MVP) of tigers? Do look at this cool blog by Aditya Singh. You can't use broadband mobile devices such as the new Apple iPhone 3G in India, since there are policy impediments holding back 3G. Some mobile phone vendors are fully ready with the equipment but are prohibited from rolling out services owing to the policy bottlenecks. Satellite phones like Iridium, Thruraya, ISAT (from Inmarsat), BGAN (Broadband Global Area Network) are banned in India. By Indian law, all calls made out from India should be able to be traced and also the user should be known. Only one particular laptop-sized satellite phone called the `Mini-M' is allowed for Government and PSU use only. This phone has been discontinued so even government / PSU customers can no longer buy a satphone. This phone also needed a specific license from the Wireless Public Commission (WPC) which makes case-to-case decisions. Further, the terminal could be activated by only one firm - VSNL. Starting a firm which does intra-India payments services using ideas such as Paypal is prohibited by RBI. E.g. India is not on Paypal's list of `localised sites'. Ila Patnaik continues her series of newspaper columns that shed light on Indian monetary policy: 13 June, 21 June. Particularly interesting is this piece in today's Indian Express which deals with a question that is on everyone's mind. When RBI decided to use interest rates to combat inflation in the early 1990s, why were such large interest rate hikes required? Why do other central banks achieve the same task with small rate hikes? 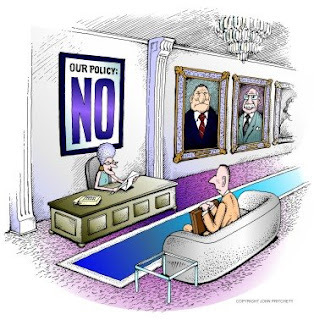 One key element of the monetary policy debate of 2006 and 2007 was the extent to which capital controls would `solve the problem' and help regain monetary policy autonomy. On one hand were people who cut their teeth on India of the 1970s and 1980s, who were used to instinctively assuming that India was a closed economy where the government had full power over capital flows. They claimed that there was no impossible trinity; all India had to do was bring in capital controls against ECB and FII and the problems would be solved. On the other side were people who understood the de facto convertibility that has come about. China has loomed large in the Indian monetary policy debate. How do the Chinese do it? was a question which was asked over and over. Is China proof that you can have stringent capital controls while having the full benefits of trade openness? Or did China lose monetary policy autonomy, adopting very low interest rates which were inappropriately inflationary? As this story in The Economist shows, it is increasingly clear that capital controls in China were not effective. Massive capital flows have been coming into China in response to a one-way bet on the exchange rate, despite an elaborate system of capital controls. In other words, China `did it' by distorting monetary policy (i.e. having very low interest rates) and not by having capital controls that worked. I remember one seminar at the Centre for Policy Research in New Delhi: a talk on whether India should do convertibility. In my discussant comments, I said this is a debate about how many angels can fit on a pinhead, for India already has more de facto convertibility than you think. It no longer makes much sense to debate whether India should do convertibility, thinking that it is a zero-one binary decision. One of his responses was: If this is correct, then there is no meaningful debate about China's decision on convertibility also. That is correct; there isn't. Replace the word `China' in the Economist article by the word `India'. Its amazing, how much of this story works for India also. You might like to also read my recent article on why India should not emulate Chinese monetary policy.